The House at Keystone Ranch is a unique, 7700+ square foot, quality, mountain home that sits on the 12th tee of the Keystone Ranch Golf Course and is convenient to the lifts and village activities. It is located in Keystone Ski Resort and is minutes from five other major ski areas. It has two fully equipped kitchens, beautifully furnished rooms, and breathtaking views. This lodge can be rented as the perfect private home for family reunions, corporate retreats, or the ultimate group vacation. Offered by Mountain Clover Homes, rental of The House at Keystone Ranch includes access in the summer to Keystone Ranch Pool. Great rooms include home theater with big screen HDTV, books, pool table, air hockey table, foosball, poker table, 2 fireplaces, floor-to-ceiling windows, golf course, summer access to the Keystone Ranch Pool, private sauna and hot tub. 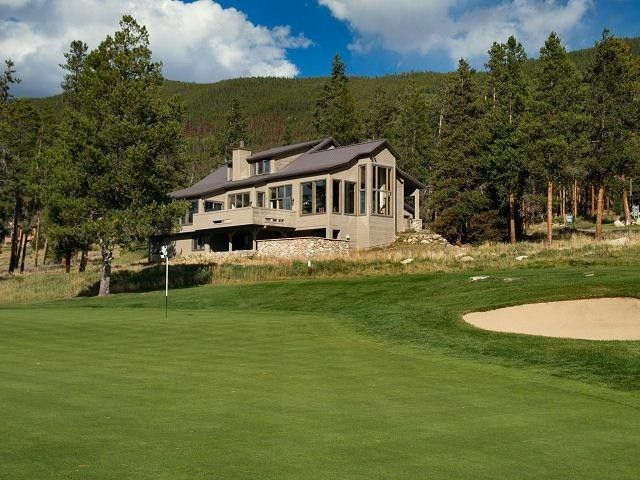 The House at Keystone Ranch is a 7700+ square foot ski and summer vacation rental home that sits on the 12th tee of the Keystone Ranch Golf Course offered by Mountain Clover Homes. conveniently located inside Resort, close to skiing. Sleeps 27. Great for large groups and lots of space and activities for kids. Two kitchens is a great feature. This large, beautiful home was the perfect size for our family gathering in the mountains. Our family spent 4 nights in this home over Thanksgiving weekend. The 9 bedrooms were spacious, with most of them having a private bathroom. Two large living spaces, one on the lower level and one on the main level, provided space for family members to relax, visit, play games, watch the football games, and enjoy the gorgeous views of the mountains. The large kitchen was well-stocked and provided ample room for several people at once to help with meal preparation. There were 3 tables and also bar stool seating to fit our entire family in one room for our Thanksgiving dinner. After a snowfall, parents took their children outside and had fun sledding and playing in the snow. Everyone in our family (ages 5 months to 84 years) enjoyed their stay. The only challenge we had was being unprepared for navigating the winding, hilly roads that led to the house when it snowed. Even though the roads were quickly plowed, they were too slick to get traction. Those who had 4 wheel drive vehicles had no trouble, but the others had to purchase chains, or cables, or snow socks to put on their tires to get out of the neighborhood. Next time we’ll come more prepared. All in all, we had a wonderful experience and would encourage others to take advantage of staying in this lovely home! The listing description was very good and the floorplan that the owner sent to us made it easy to divvy up the rooms. We were impressed by the well stocked kitchen and laundry and were happy to find soap and shampoo in each bathroom. The home is older, but its well maintained and interesting with lots of colorful tile and extremely large rooms. It was spotless when we arrived. The owner was very nice and helped us with the planning and the manager arrived with cookies shortly after we got there and helped us with questions. We would recommend this home to large groups or families or even a company event. We loved the pool and Keystone Village. We rented canoes and fed the fish and our grandsons biked down the mountain. Perfect vacation spot. Thank you, Mary! We were so happy to have you! Fabulous house in a gorgeous setting! We had our family reunion in this house and we could not have made a better choice. The house had everything we could ask for in terms of amenities - a very spacious great room for all of us to gather in, a fully stocked kitchen, a nice deck with a grill, a basement with lots of entertainment options, bedrooms that were large and very comfortable and of course, gorgeous views of the golf course and mountains. We had several email exchanges with Carol and Amy prior to our arrival - they were very attentive to all our questions and we could not have asked for more gracious hosts. We have rented several houses through VRBO over the years and I can say without a doubt that this house is a gem. Thank you so much for your kind words. We felt that our guests were the 'gem' in this case. It is a pleasure to share this home with people from all over the world and you reminded us about why we do it. Thank YOU! This is a terrific house! We made this reservation last year and when we were showing the home to family members a couple of months ago, came across a very bad review and we were terrified. I called Carol, the owner, and she assured me that much of the review was inaccurate and that the few items that had been specifically mentioned (i.e. the stove) had been repaired or replaced. We were skeptical and showed up nervous because we didn't know what to expect. Bottom line, this house is beautiful, squeaky clean, and the stove is brand new and really nice. The hot tub works fine (and it's also almost brand new) and the views are terrific, the games all work fine and the space is fantastic, and the most important part was that Amy was just a call away when we needed her for information. The bedrooms are very nice and we were particularly impressed with sheets and towels and the nice bedding. I don't usually leave reviews, but I feel like this house deserves a five star rating because of its size and comfort. I'd leave the people six stars if I had the chance because they were great folks to work with. The whole family was happy with everything that we found at this house. We particularly liked the game room, the hot tub, the location, the views, and the kitchen. There were plenty of towels and supplies and we were impressed that all of the soap for dishes and laundry was supplied. The owner has created a great place for a big group to hang out together. I can recommend this rental to anyone traveling with a big group. Activities: skiing, golf, boating, hiking, biking, cross-country skiing, fishing, shopping, white-water rafting. Area: Keystone Ranch is an upscale area of Keystone Ski Resort ~ characterized by large, exclusive vacation homes on treed, private lots. Keystone Ranch House is located within a mile of the home and has a five star restaurant and the clubhouse for the famous Keystone Ranch Golf Course. There is also a pool and fabulous stables. World Class Keystone Ski Area is within minutes of the house and is serviced by private door-to-door shuttle. Rates vary depending on length of stay, time of year, and number of guests.